A not so long time ago in a state far, far away….. The Alaska team woke up to yet another chilly but beautiful morning. We were all very sore from the Butte, which we climbed as a team the night before, so naturally some of us were a little cranky. Emily’s “family” along with Noah and Dan at the top of the Butte. Uncle Kirk and Oboe (Owen L) went on a 4 mile run, and were blessed with stunning Alaskan scenery. During our devotional period in the morning, we focused on respect. We learned that to be effective leaders we need to be open to advice and to not pass judgement quickly on others. After a delicious breakfast of french toast and mini sausages, the students arrived for the day camp. We were very pleased that more students had turned up, showing that God was really moving among the people. The two skill clubs today were fun with science (building Popsicle-stick towers) and wood burning (burning designs on the seats and backs of camp benches). Our life groups talked about dating and friendship, which really brought the team and Sutton students together. The afternoon consisted of serving individuals around Sutton. 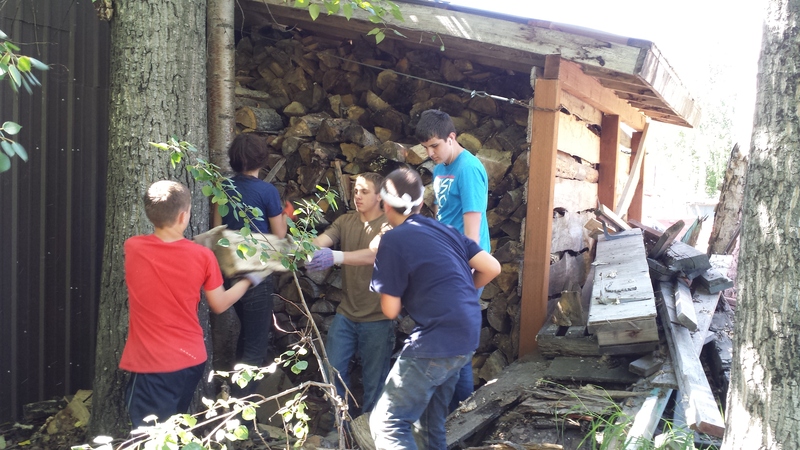 We went to Pastor Larry’s house, wood splitting and stacking, weed wacking and mowing, and fence building. Stacking wood at Pastor Larry’s house. 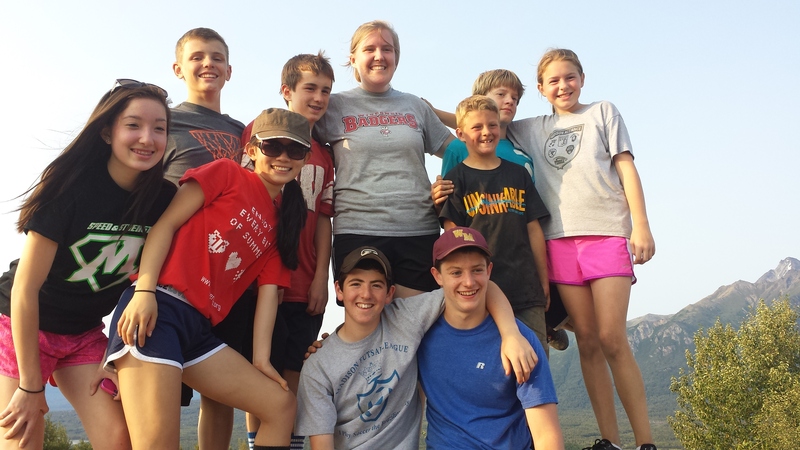 We are happy to say after another day of Gaga-balling and community serving, our missions team is still going strong. God has gifted us with a great second day at Eaglecrest. 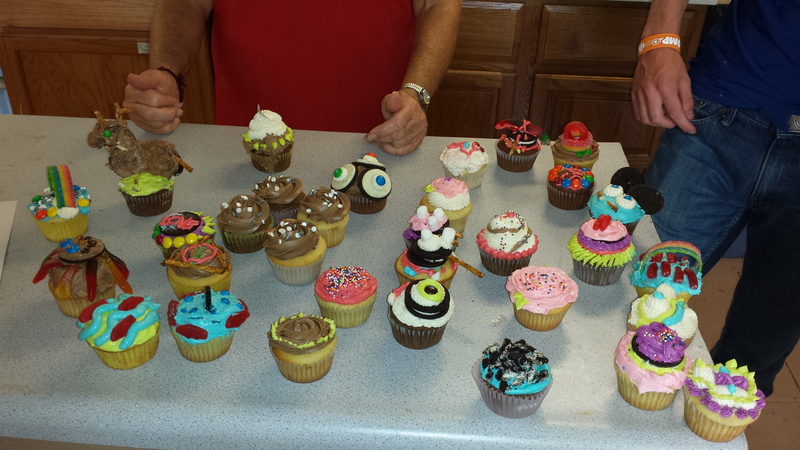 Baking skills club decorated cupcakes yesterday. They were delicious! Shoutout to Michael and Maggie Lamson~ Owen is still alive. Shoutout to Yijing and Rayray~Grace loves you! You guys are awesome! Keep up the good work. I wish I could be there to see Jesus working through you all, which He obviously is doing. But i was there you would all be losing in Gagaball! Hahahahaha. Have fun. Keep blogging. Peace! Joshua misses you too Grace!!! Emily has a fine looking family- thank you for the great updates and photos! Shout out to ALL- keep up the great work!